Students and K-12 teachers who need an official copy of their transcript should order through www.getmytranscript.com (secured site) and select North Dakota State University. Reminder about transcript ordering: Individuals are encouraged to review their unofficial transcript (instructions below) to ensure all grades are posted prior to ordering an official transcript. Please allow 2 - 3 weeks once you have submitted your course work to the instructor for grades to be posted to your transcript. Note: Be sure to delete your browsing history to ensure that you are viewing the most up-to-date version of this webpage. Also be sure to allow pop up windows for the Campus Connection webpage, otherwise you will not be able to view your transcript. 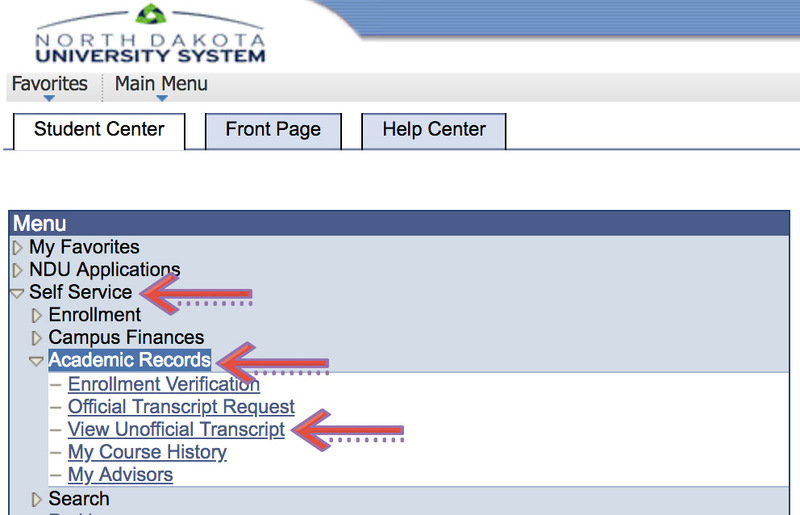 To view or print unofficial copies of your transcript follow these directions exactly as stated to ensure you are viewing the most up-to-date version of your unofficial transcript. Enter User ID & Password to login to Campus Connection. If you are a new student and have never logged into Campus Connection before, you need to claim your NDUS account to set up your User ID & Password. To claim your NDUS account you need your EMPLID, which should have been sent in an e-mail or by postal mail from the North Dakota University System after registering for your first class. To claim your NDUS account, so that your can obtain a User ID & Password, follow the directions listed on the NDSU Registration and Records website. Note: If you do not have your EMPLID and need to obtain it to claim your account, follow the directions at the bottom of this page. Then click view unofficial transcript. In the next screen, choose North Dakota State University for the academic institution and choose either of the following options for the report type, then click the view report button. Note: Do not click on view all requested reports because you may be viewing unofficial transcripts prior to a grade being posted. What if I do not know my User ID and Password? What if I do not know my EMPLID (student id)? To obtain your EMPLID you will need to follow these directions. Under Menu click "What is My EMPLID" link. Fill out information & submit, Write down your User ID. Note: Your EMPLID will be a seven digit number. You may be asked for this number when communicating with our office. Contact NDSU Distance and Continuing Education by email or at 701-231-7015. Our office hours are between 8:00am and 5:00pm and we will do our best to respond promptly.